I once told a friend regarding Hawkeye that if Matt Fraction spent an entire issue dealing with Clint Barton doing the laundry I’d love every minute of it. It seems I almost got my wish in the special Christmas themed Hawkeye #6, which, for half the issue, is Clint trying to get his DVR to work. But that is the beauty of Matt Fraction’s run on Hawkeye – although this issue also deals with the Russian Mafia and a crisis of faith, the best parts of this issue, and in this series in general, isn’t always the action. It’s the heart. It’s almost Christmas time in the apartment that Clint Barton a.k.a. Hawkeye lives. Over the next six days, he will deal with with a broken satellite dish, A.I.M., the Tracksuit Mafia and his own DVR. As he deals with the issues of owning his own apartment (reluctantly bought off the Russian Mafia back in issue #1), Clint must also ask the question: can a man who is trying to do good, still end up making things worse? This is how the heart makes its way into Hawkeye. Clint Barton is a normal, regular human being. Granted; a regular human being who is also the greatest sharpshooter alive, but Matt Fraction taps into the human side of his psyche, stripping away the “heroic” traits of a super hero comic, and drawing on the more everyday experiences of this Avenger. We see him desperately try to avoid spoilers to his favourite television show, convince a neighbour his name isn’t Hawkguy, and try to clean his apartment. It is these moments that give the issue its charm – Clint is a normal human being, and acts like so. Even the cameos from other famous Marvel heroes give them more grounding features that most other writers gloss over. That’s not to say that this issue skips over the heroic. The Tracksuit Mafia (or as I like to call them the “Bro Mafia”) return, intent on reclaiming their lot back. We meet their leader this issue, after a few surprisingly unsettling panels, which prompts Clint’s crisis of faith. 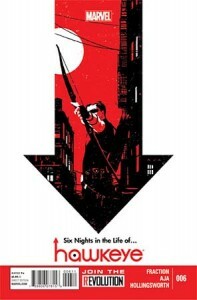 David Aja’s art, combined with Matt Hollingsworth’s colours look absolutely sublime. The wonderfully expressive faces thanks to a simple art style, combined with the flat colour palette and striking purples, make this one of the best looking comics all year. The layout also looks absolutely stunning, as Aja manages to fit more panels than one would think possible on a single page. It also helps that there is a nod to the old X-Men Arcade game that looks fantastic. Aja’s work on Hawkeye just looks brilliant overall. If you haven’t picked up Hawkeye yet, let me ask you a question: what is wrong with you? Go and pick up the first six issues and get lost in the world of Clint Barton. Give these people money to make more comics – just so I can see that laundry issue.